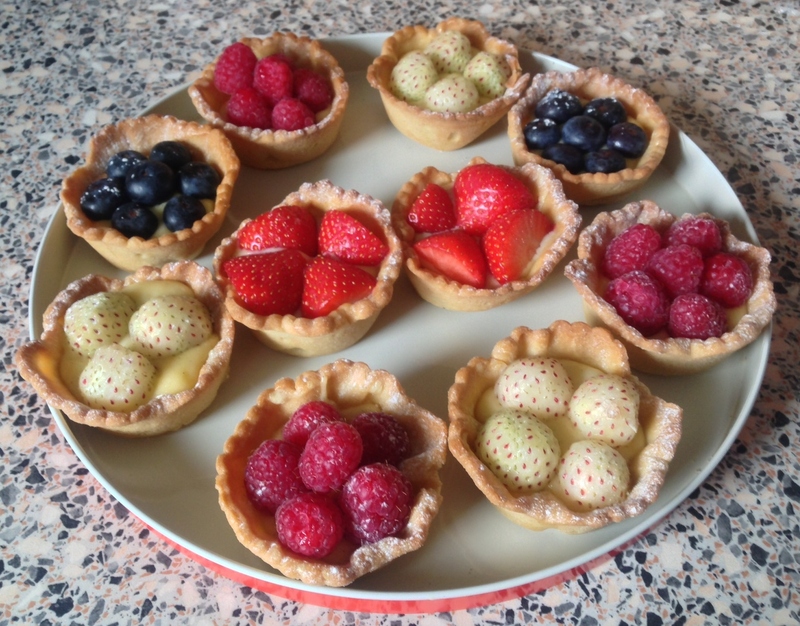 Having faced a Bakewell based baking disaster last weekend I attempted to restore my baking mojo this weekend with some little fruit tarts for post dinner sweet treats at the Sister-In-Laws (plural possessive pronoun rather than singular). The recipe was courtesy of Lily Vanilli’s Sweet Tooth which was quite apt as it was a birthday present from them last year. Now, they may have selected this book as a gift because they were as taken with the rather fetching fuschia edged pages as I was when I opened it. However, it may have been because of the great and original foodie ideas therein – & not just for cakes, biscuits and the like, but also ice creams etc. I have to admit that I didn’t follow all the ‘chilling’ recommendations whilst creating the sweet shortcrust pastry dough because: a) I just didn’t have the time and; b) I don’t have the luxury of owning a freezer with room to hold a mixer bowl of pastry ingredients. Nevertheless, I managed to rustle up a not too shabby dough in a matter of minutes and chilled in the fridge overnight. Quite an achievement seeing as the pastry for last weeks Bakewell tart (courtesy of Mr Peyton’s British Baking) had taken two attempts make, and was still completely unmanageable resulting in a pastry patchwork quilt. Even the instructions for making the crème patissière filling (my first time) were written in a manner that meant I was able to execute with relative ease and minimal lumps. Only things I would probably tweak if doing again would be to roll the pastry out a bit thinner than the recommended 3mm, and to maybe try using little tart cases (expensive to own twelve of them though) or a shallower mince pie tray rather than the suggested deep fill muffin tin/tray. I’ll definitely be using this book much more in the future though if this first outing is a gauge of what else is to come. I topped the tarts of with a selection of fruits, most notably the pineberry (an inverse strawberry with white flesh skin and red seeds) which proved to be a talking point but were also the last to be eaten, so maybe just a bit too off the wall.